Thanks to attention by the media, we are all aware that brick and mortar stores see an immense increase in traffic on Black Friday in the United States. Online retailers also see a dramatic upswing in sales the following Monday. This time between Thanksgiving and Christmas can mean a steady stream of shoppers. However, holidays aren't necessarily the only busy time for certain types of retailers. When students head back to school, your local office supply retailers probably face a flood of customers. College bookstores operate with a retail rush two to four times each year. Sporting goods stores may experience an influx of sales after a huge ball game. No matter what segment of retail your business may be classified, we all have periods of peak sales. 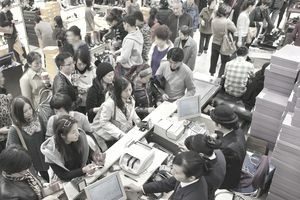 Although your store's peak period may be called something specific, any retail rush is the period of time when retailers are struck with a higher-than-average number of customers and sales. For some retailers, it can be quite stressful. For the unprepared, it can be downright disastrous. Before you experience your next retail rush, use the following tips to maximize composure and minimize headaches. Make sure the store has plenty of bags, gift wrap, cash register tape, gift certificates, and all the necessary office supplies. Examine inventory levels. Review the open-to-buy plan, inspect the store's budget, and reorder any impulse items and other top sellers to capitalize on the extra exposure. Check the currency in the cash registers and determine how much petty cash you should keep on hand. If you expect to receive a lot of merchandise for your peak sales period, reorganize and clean up the stock receiving area. If frequently used items are accessible, it will reduce stress during the retail rush. A messy workroom only creates chaos and confusion. Before it gets busy, conduct any needed maintenance to get the store looking its best. Replace, repair, or refinish worn store fixtures. Schedule the floors to be polished or have the carpets cleaned. A fresh coat of paint will also go a long way to sprucing up walls. Make sure all the lighting is in proper working order. Train the new staff well before the season begins. Be sure to schedule enough employees during peak periods. As the number of people who walk in goes up, it is important these new customers don't take all of your attention away from regular customers. Shoplifting may be a bigger threat at this time. It may be a good idea to consider hiring or increasing the store's security. Remind your employees (and yourself) that in order to have a positive atmosphere for customers, they must be well-rested, pleasant, and prepared to deal with any difficult situation. The best way to beat stress is by getting plenty of rest. Remember to maintain break schedules during the retail rush. Just 10 minutes away from the sales floor can renew a salesperson. Plan a party to celebrate with the staff after the hectic period is over. They should be rewarded for their hard work, too. Expect to see a number of returns immediately following your store's retail rush. Naturally, the more you sell, the more returns you may receive. Depending on the size of your retail store, consider allocating a specific area or one or more employees solely for returns. This will free up remaining staff members to deal with other customers, turn returns into sales, and help prevent return fraud. Once the rush is over, you'll have a chance to relax and catch your breath. That is, only for a moment. Unless your business closes after the busy season, you'll want to evaluate and measure the performance of sales and staff. Then it is time to begin preparing and planning for the next peak sales and holiday shopping season all over again.